Our station has been removed for seasonal upgrades. The target date for redeployment has not yet been determined. 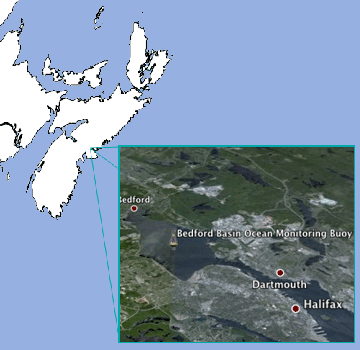 BBOMB is a coastal ocean monitoring buoy located in the Bedford Basin near Halifax, Nova Scotia, Canada. Through the use of near-real time data collected by the various sensors on the buoy, the BBOMB project aims to develop a rigorous understanding of important ecological processes in the Basin and the connecting ocean. A collaboration with the Department of Fisheries and Ocean's Bedford Basin Plankton Monitoring Program, the project also fosters partnerships between the wider public community, scientists and environmental agencies in the spirit of education and the provision of information relevant to all those who use the ocean.